In my last paper a new subfamily was suggested for the genus Bostryx s.str. However, it was not published according to the ICZN rules; an oversight that was corrected by a small paper that just appeared in ZooKeys. The link to the abstract and PDF may be found here: http://bit.ly/NEw61c, doi: 10.3897/zookeys.216.3646. Thanks again to Philippe Bouchet for kindly making me aware of this needed action. Breure, A.S.H., 2012. The status of the genus Bostryx Troschel, 1847, with description of a new subfamily (Mollusca, Gastropoda, Bulimulidae). – ZooKeys 216: 1-3. This entry was posted in Uncategorized and tagged bostryx, taxonomy on August 22, 2012 by bramb. Just published: a paper by F.G. Thompson on Urocoptoid land snails from Mexico, Guatemala and Honduras. The species-level taxonomy of three closely related urocoptoid land snails, Epirobia Strebel & Pfeiffer 1880, Propilsbrya Bartsch 1906, and Pectinistemma Rehder 1940, are reviewed and a new family is erect- ed for them. Gyrocion Pilsbry 1904 and Prionoloplax Pilsbry 1953 may also belong in this new family, but remain unknown anatomically. New species named in this work are Epirobia subsulca n. sp., Epirobia brevior n. sp., Epirobia longior n. sp., Epirobia interupta n. sp., Epirobia adusta n. sp., Pectinistemma roesslingi n. sp., Pectinistemma gracilidens n. sp., and Pectinistemma ceramicum n. sp. Epirobia alternans Thompson 1976 is elevated from subspecific status within Epirobia swiftiana (Crosse 1863) to full species rank. Epirobiidae new family is recognized as distinct from other urocoptoid families by char- acteristics of the shell, the reproductive system, the radula, and the genome. Morphology and molecular data support the monophyly of the Epirobiidae and their independence from other groups of urocoptoid gastropods. These data also support the independence and monophyly of the Holospiridae Pilsbry 1946 and the Eucalodiidae Crosse & Fischer 1868. An very elegant paper about very elegant snails! Thompson, F.G., 2012. 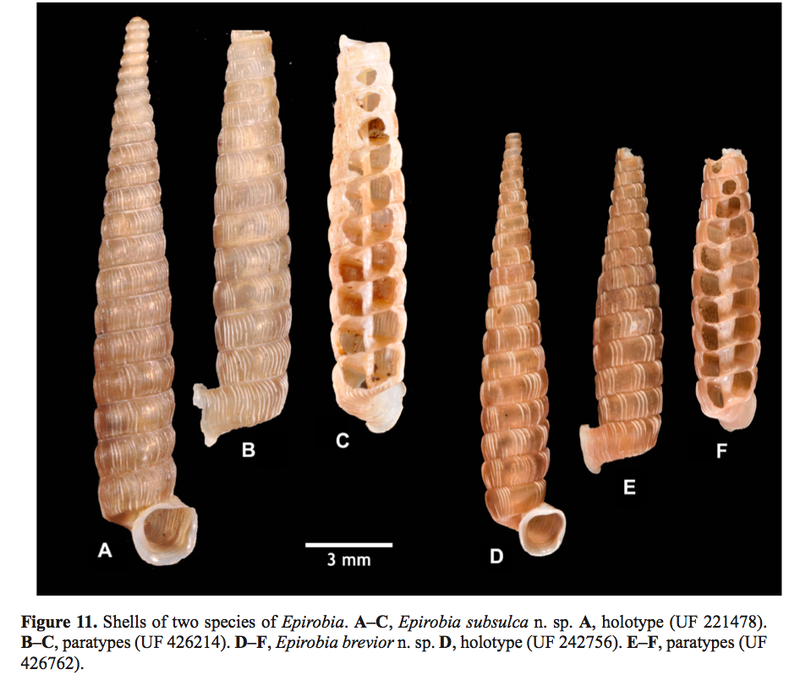 The land snail genus Eporobia and allied genera in México and Central America, with the description of a new family, the Epirobiidae (Gastropoda, Pulmonata, Urocoptoidea). – Bulletin Florida Museum of Natural History 51: 167-215. Available at http://www.flmnh.ufl.edu/bulletin/vol51no3.pdf. This entry was posted in Uncategorized and tagged guatemala, honduras, mexico on August 14, 2012 by bramb.